Companies have many technology choices when it comes to contact centers. Most businesses have some understanding of the benefits of cloud solutions – they are operational-friendly, highly flexible, reliable, scalable, and most importantly, cost efficient. However, when comparing cloud versus on premise contact center solutions, monetizing the cost savings and making a selection that precisely matches your unique business needs can be a daunting task. Here is an overview of each option as well as 6 factors to consider when evaluating the merits of each solution. Cloud computing is a model driven by on-demand network access to shared computing resources that is provided by a third-party software vendor as a per-user subscription service. This means that all that is needed for each user is a computer with a network connection and a web browser to access cloud software. On-premise hosting of a call center means that all aspects of the hardware and software that comprise the system are fully contained within the enterprise's facilities. 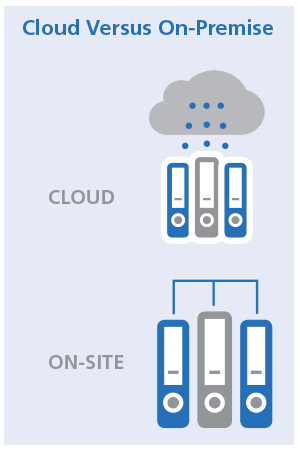 The complete infrastructure for such a system include servers, switches, computers, phones as well as the necessary redundancy and technical support. On-premise hosting of a call center requires significant investment in the purchase, installation and ongoing support of all the hardware and software components of the system. This also requires more dedicated IT staff to insure that systems are continually running in an optimal fashion. Cloud-based systems forego these large capital expenditures in favor of subscription-based services that cost significantly less than building and maintaining the system in-house. The need for support staff is also reduced as well since the vendor providing your cloud services will provide the technical support functions for your team. The ability to increase contact center resources in the cloud-based scenario can be as simple as contacting your vendor and adding more licenses to your subscription. The only hardware you may require is an off-the-shelf PC with a current web browser. On-premise contact centers require more planning and lead time to bring new agents on-line. The hardware requirements are more intense and they will also require configuration and installation of all the software elements to complete the system for each seat. In an on-premise contact center, maintaining flexibility and handling peak traffic scenarios requires additional hardware to be stored to meet potential demand. These idle resources consume important capital that could be used elsewhere to advance the overall mission of the enterprise. In the cloud-based model, the organization has retained unlimited flexibility to scale the number of seats up or down with little to no notice. Historically, on-premise contact centers offered the most capabilities of customization. Since the organization is designing and building the system, they are free to choose the third-party components that most meet their need for customization. Cloud-based providers have quickly closed the gap and many are offering robust customization options that were not available just a few years ago. Most cloud software vendors are constantly making improvements that are deployed to all users each time they log-in for a new session. Because the vendor warehouses all aspects of the software, they can keep all their clients up-to-date seamlessly. Pushing upgrades out across an on-premise contact center requires some additional thought and planning. Do the agent's current operating systems meet the new locally installed software being upgraded? This question and many others need to be carefully thought through. The software companies that provide cloud-based software services utilize multiple data centers and have developed complex systems that are designed in every way to keep applications online 24/7/365. They also maintain and utilize cutting-edge security measures to secure your valuable data. Generally, on-premise contact centers lag behind in these areas because the primary mission of the enterprise may be completely unrelated. For example, a large apparel company might be experts in marketing and retail operations, but will have to devote an inordinate amount of resources to perform at the same level as a cloud software specialist. On-premise contact centers used to represent the gold standard and presented companies the most control and assurances they could deliver a world-class Customer Experience. The pure speed of technological advances now gives cloud providers a significant value proposition to offer clients. A careful evaluation of these factors will provide you the insight needed to make the right choice for your enterprise. Recognized by CIOReview as one of the Top 20 Most Promising Customer Experience Solutions Companies, PPT Solutions empowers our Clients with transformational business solutions that deliver exceptional performance, outstanding customer experiences and measurable results. Visit pptsolutions.com to learn how we can optimize your business and Customer Experience. 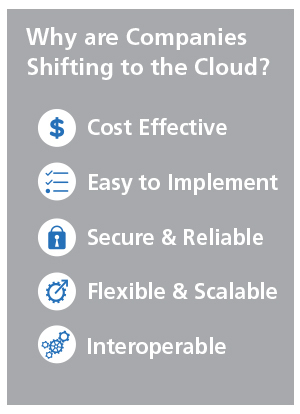 "Selecting between a cloud vs. on-premise solution can be a complex and challenging decision. It's important to bear in mind that's there's no one-model-fits-all solution. It's critical you consider the merits of both options to ensure your maximum ROI." Simply provide your email address and we’ll share periodic insightful articles and case studies. We’d also welcome the opportunity to learn more about your specific Customer Experience and business needs.